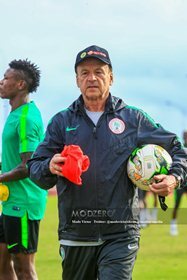 Gernot Rohr has stated that Bordeaux's new tactical formation has similarities with the 3-5-2 system he deploys while coaching the Super Eagles. The German tactician tested the 3-5-2 formation in the second half of the Super Eagles 2-1 loss to England in a pre-World Cup friendly and used it in subsequent matches against Czech Republic, Iceland and Argentina last year. Predominantly a right winger, Samuel Kalu was asked to play as a right wing-back in a crucial Africa Cup of Nations against South Africa in November, and Bordeaux manager Paulo Sousa is thinking in the same direction. ''This system in the end is a 5-3-2 rather than a 3-4-3. In the defensive position, they find themselves as wing-backs, Youssouf Sabaly and Maxime Poundje, they are not attackers,'' Rohr told girondins4ever.com. ''It is to stabilize the defense first, to have a safe and solid foundation. ''Then if you have fast players....I played like that with Nigeria, with Samuel Kalu on the right side, it's a system to quickly counter the opponent and it can be very interesting if everyone does his job. ''Tactically it is a good choice but then you have to see the behavior of the players and the implementation of this strategy''. Kalu is still recovering from a hamstring complaint and has not played for Bordeaux since March 9.